Is it possible to have too many tomatoes? Some people say it is. I am still eating cherry tomatoes right off the bushes, but I had some bigger farmers’ market tomatoes to use. This soup, from my favorite low fat Indian cookbook by Husain and Kanani, has a little heat to it because of the black pepper. If you want it milder, use less. Also, when I make it again, I think I will cut the oil down to 1 teaspoon. It would bring the fat grams down to about 1/serving, and I actually found it a bit oily. And, it says to puree it in a food processor, which did not make a completely smooth soup. I rather like the slight texture, but I think if you pureed it in 2 batches in a blender it would be smoother. This was almost too much liquid for the food processor, and began seeping out and made a mess. 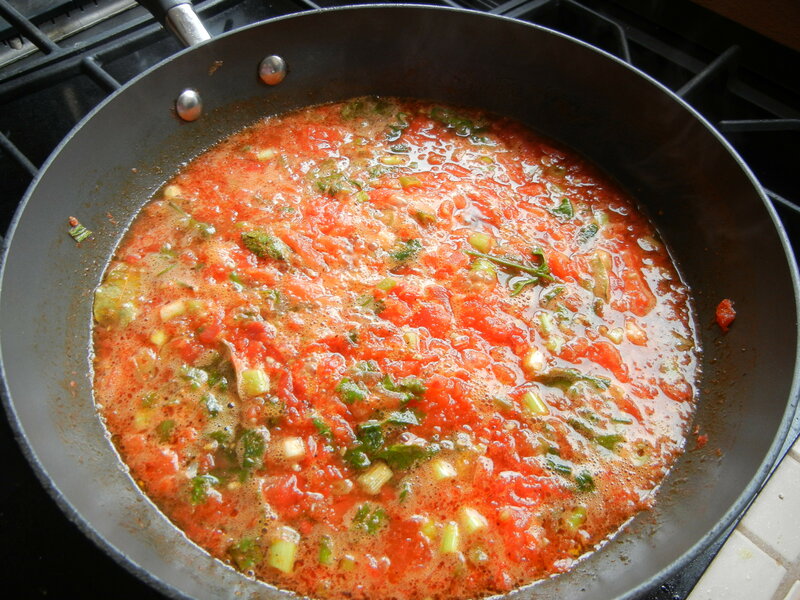 In a large saucepan, heat the oil and fry the tomatoes, bay leaf, and spring onion for a few minutes until soft. Gradually add the salt, garlic, pepper, coriander, and water. Simmer uncovered over low heat for 12-15 minutes. Meanwhile, dissolve the cornstarch in a little cold water to form a creamy paste. 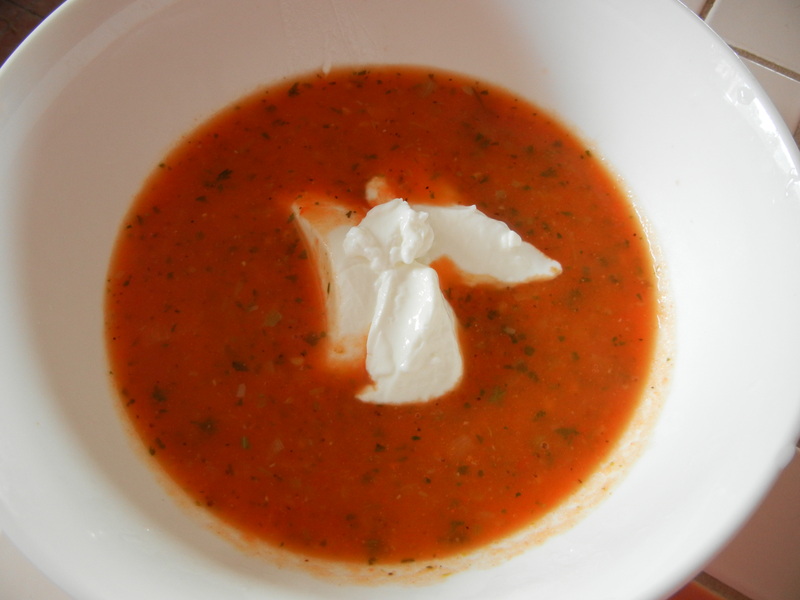 Remove the soup from the heat and allow to cool a bit. Puree in a food processor. NOTE: To peel tomatoes, plunge them in very hot water for a few minutes. Remove and allow to cool slightly. The skin will peel off easily. I needed something to bring to the office for a surprise “man shower” we were having for a soon-to-be new dad. I wanted to make something from my garden, but it was between the spring veggies (snow peas, etc.,) and the onslaught of zucchini and tomatoes that was surely soon to come. I managed to pick a handful of baby zucchini and yellow squash and cut them up for this nice curry from my favorite low fat Indian cookbook by Husain and Kanani. One of the quickest ways to lower the fat in many recipes (besides substituting buffalo for the beef) is to eliminate the fat or oil. If the oil is only being used as a vehicle to soften veggies and is not a critical component of the flavor, you don’t need it. You can steam fry the veggies. Don’t remember how to steam fry? Spray a large frying pan (or wok in my case) with cooking spray and heat over medium high heat. Add your onions, celery or whatever the recipe calls for. Cook, stirring frequently. As the veggies start to turn golden, add a little water and stir. It will soon evaporate. You can do this several times until the veggies are softened or you reach the shade of golden brown you are looking for. You lose 14 grams of unneeded fat for each tablespoon of oil you eliminate, and you still get the good flavor of sautéed onions, garlic, and the like. So in a dish that serves 4, you eliminate 3.5 grams of fat/tablespoon of oil eliminated. This recipe would have made nice leftovers, but there weren’t any. It is not a particularly incendiary curry, and thus suitable for friends who don’t like “hot” foods. 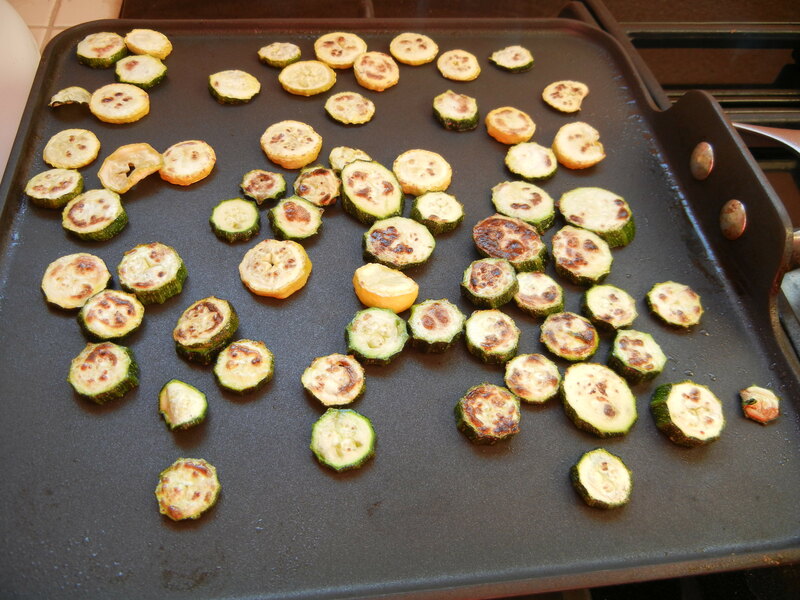 Either broil the zucchini slices in a preheated broiler for 3 minutes, turning once, or cook them in a frying pan or griddle pan coated with cooking spray until they are lightly browned (this is what I did). Set aside. 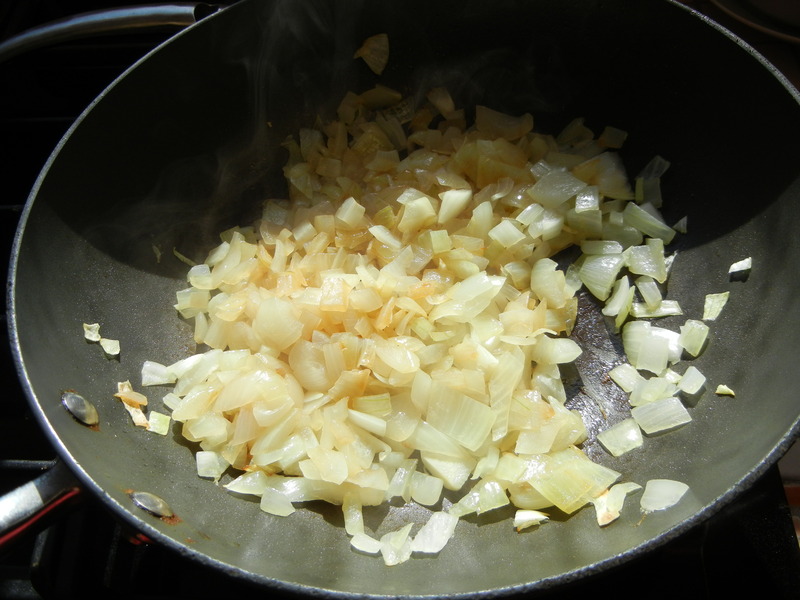 Steam fry onion until golden brown. Add buffalo and stir fry for 1 minute. 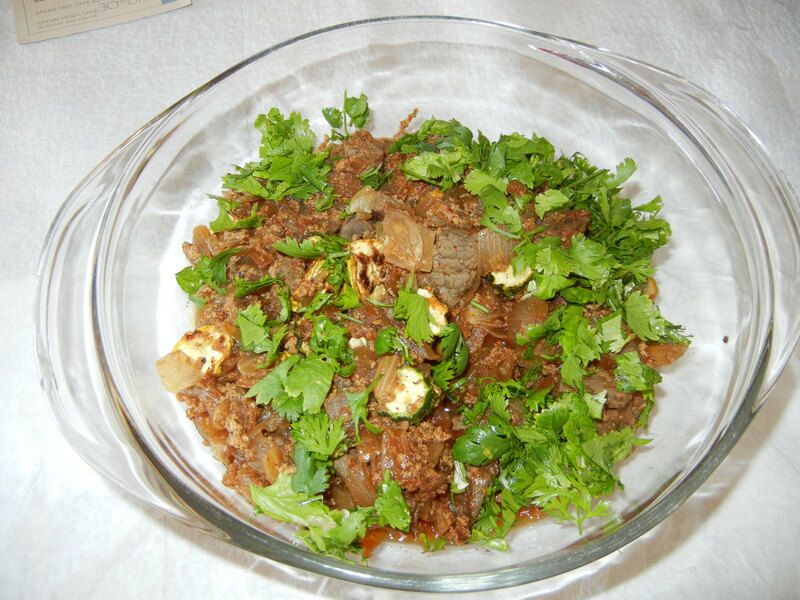 In a small bowl, whisk together yogurt, garam masala, chili powder, garlic, ginger, and ground coriander. Pour yogurt mixture over the buffalo and stir fry for 2 minutes. Cook over medium to low heat for 12-15 minutes. Check to see that the buffalo is cooked and the sauce is quite thick. Then gently add zucchini. Cook for about 5 minutes. Serve garnished with cilantro. I served it with couscous for convenience, but I think it would be better with rice. Makes 4 servings at about 2 grams of fat/serving. NOTE: Garam masala is a Hindi term meaning hot (garam) spice (masala). The word garam refers to intensity of the spices; masala is pungent, but not hot in the same way as a chili pepper. The actual mixture of spices used in garam masala differs regionally, and even from family to family, with a wide variety across India. You can buy an acceptable bottle garam masala from a number of companies, or you can find a recipe in an Indian cookbook and make your own.